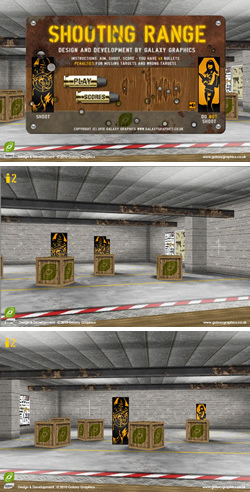 Shooting Range, an Away3D Flash game by Galaxy Graphics. The Shooting Range is the first true 3D game to be developed by Galaxy Graphics, and it makes use of the free opensource Away3D libraries. The gameplay is easily understood — turn, aim, shoot and point, and the entire game can be played with only the mouse. The player has 49 bullets and has to hit as many soldier targets as possible, taking care not to hit the student targets, or let a soldier target fold back down without being hit. Shooting Range also incorporates some neat details such as the crates rotating when shot, the 3D background showing through the title screen bullet holes, and built in XML driven score table, not to mention the standard Galaxy Graphics score-sending and in-Flash swear word filtering. If you are interested in licensing this Shooting range game for your own site, or a custom variant of it, please contact us for more information. Shooting Range Flash source code. Looking for Shooting Range source code / Actionscript 3.0 / .fla file ? The source code for this game is also available to buy from Galaxy Graphics. Click here to contact us about Shooting Range source code.